This is a guest post from Catherine McCord of One Potato and Weelicious. You with me? Great, let’s chat! Now that I have three kids, I have less time to cook during the week than ever before. As a result, my slow cooker has graduated from being a good friend to the love of my life. Why? It basically takes all of the time, effort and clean up out of cooking. I can put just about anything in it, turn it on, go about the rest of my day and come home hours later to a delicious meal my troops will devour. That’s how this Slow Cooker Mexican Lasagna was born. I love lasagna, but I also love to do fun spins on classic dishes. 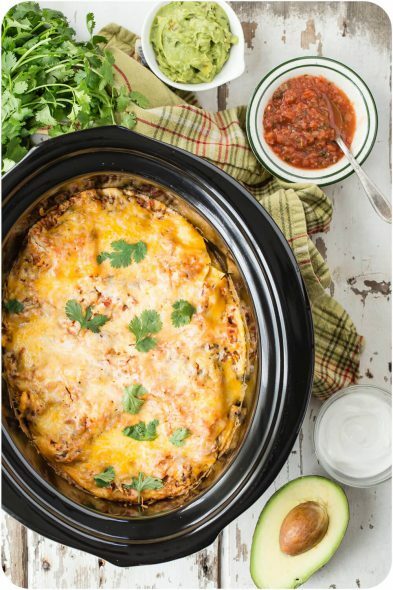 So with this recipe, lasagna noodles are replaced by corn tortillas (yes, this dish is totally gluten-free); traditional Mexican flavors like grated cheddar, cilantro, salsa, sweet corn and more stand in for their Italian counterparts; and lean ground turkey and cumin bring added texture and a distinctive taste. Another difference is how easy this dish is compared to making a traditional lasagna. Thanks to your crock pot, simply chop your ingredients, dump them in the slow cooker and give a stir. Your work here is done (and your kitchen will smell heavenly all day). And if you’d like you can even simply layer all the ingredients the night before, pop it in the fridge and then turn on your slow cooker the next morning. That was the easy part in the title. Here comes easier: If you don’t have time at all during your busy week to prepare dinner (sound familiar? ), I have another solution. About a year ago, I launched a meal kit delivery service out west called One Potato. After hearing from one too many members of the Weelicious community that the other meal kit delivery services were not family friendly, I knew there was a better way. Utilizing recipes from both Weelicious and my cookbooks, One Potato’s mission is to keep things simple with all of the pre-prepped ingredients for 3 organic family-friendly meals (examples pictured below) arriving at your door each week to help you get dinner on your table in 30 minutes or less. Lisa and her family tried One Potato last week, and I was so happy and proud when I saw the pictures she posted of her girls making it here! If you live in California, Arizona or Nevada (or want to get a great holiday gift for someone who does) One Potato is offering 100 Days of Real Food families $20 off their first order at checkout with the code REAL20! Sign up here! 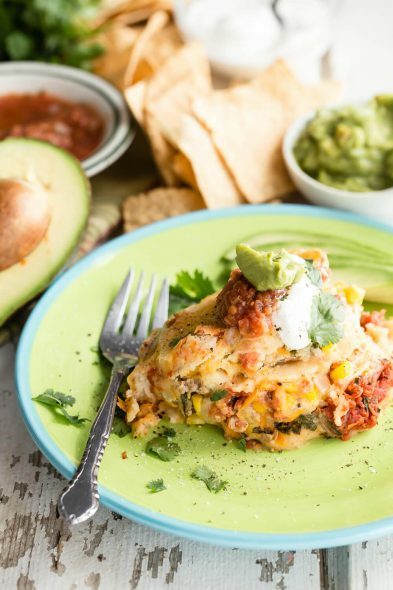 And now here’s the Slow Cooker Mexican Lasagna I got you all excited about – enjoy! Heat 1 tbsp of olive oil in a large sauté pan and cook the onions for 3 minutes. Add the garlic and sauté an additional minute. Previous Post: « Want to Cut Processed Food? Where to Start! I love new crockpot recipes– especially when they go beyond soups and stews. I make a Mexican lasagna in the oven and never dreamed of making it in the crock. Can’t wait to try your recipe. Looks delicious! Let me know if you make it! SO easy and one of our family faves! I do the oven one too. My only issue with this recipe (like many crockpot recipes) is that you have to sauté everything before it goes in the crock pot. I understand why, I don’t think it would come out the same if you didn’t but in my opinion, the advantage to the crock pot is that you pull stuff out of the fridge, or pantry, or counter, dump it in, and turn it on – no prep required. I would be interested in seeing those types of crockpots. I have a wonderful 7-quart crockpot with a removable crock, but it’s just a plain Jane high-low-off setting type. Yes! Flour tortillas will totally work. I just like the taste of corn. Buy organic tortillas if possible to avoid GMO’s. Any suggestion for an egg replacer for this dish? Son has an egg allergy. I would try Ener-G egg replacer or a mix of flax and water. Is this a meal that you can freeze for a later date? You could totally make it in a freezer bag, freeze it, cut open and pop in your slow cooker adding 30 minutes to the total cooking time. Hope you make it! I’m from the UK and I’m ‘lost in translation’! Does ‘Tortilla’ mean wraps or chips? It means chips in the UK, (and they are pictured) but I wasn’t sure if that’s right. Thanks – Now I can make it! I totally get it! Tortilla in this recipe means soft tortilla. Does that help! I believe she means the wraps. How long can this cook in the crockpot without being yucky? I need to assemble crockpot and go to work for 8 hours. Even on low….that is still well more than 2 hours. I know my family will love this, can’t wait to try it! Thanks so much for sharing it! The One Potato Meal Delivery sounds perfect for me, I’m so disappointed I don’t live in her delivery area. :( I’ve tried Blue Apron, their meals are great, however too much prep time for me and my family. I love that One Potato sends their meals alread chopped/prepped! Hope she extends her delivery area soon, would love to try it out. I am not in their area either! So sad because unlike the other companies they give kid discounts and prechop the food for you! I have been using another company where you go make your meals for the month there or they make them for you for $20. It isn’t organic but at least it isn’t processed food either! So true! Wish you were in our area. Feel free to share the REAL20 code with friends in CA, AZ and NV :) We’ll hopefully be expanding in 2017! I hear you Yvonne! That’s the reason we started One Potato. The meals take 30 minutes or less bc we send you our awesome sauces and some items prepped. Make cooking so much more fun on busy nights. If we do a double recipe and freeze the ingredients in separate ziplocks can we use this as a freezer meal? Thaw it the night before and toss it in the crock pot the next day? You could even cut open the freezer bags and place directly into the slow cooker frozen and just add 30 minutes to the cooking time. I have a 7 quart crockpot. We use it a lot! In your directions you state that you would turn it on in the morning. I think that if you did that, it would sit too long for dinner. Might be good to change the wording to turn on in the late afternoon for dinner. Not sure that I want it sitting on the counter for 8 hours. Try Ener-G egg replacer. Luckily there’s only one egg used as a binder, so it will work great! Cassie we have an egg allergy too. Whenever things call for a egg I replace with flaxseed and water mixed together. Works as a good binder. Usually use 1 Tbsp flaxseed (I get crushed up kind) and 3 Tbsp water, leave alone for 5-10 min then use in any recipe. I will be trying to recipe today. Yum! Made this recipie tonight. It is fantastic! 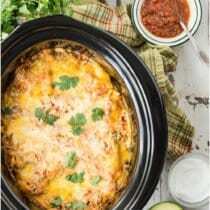 Most Mexican “casserole” type dishes can be too heavy but this one is great! Great flavors and healthy. Quick and easy and so yummy. Could I make this in a 9×13 pan and bake in oven? Maybe 350 degrees for 45 minutes? Thank you for your help! Made this last night. Super easy and tastes great. The whole family loved it and asked me to make it again. I made this last week and my family devoured it. Thanks for sharing this tasty and healthy recipe! I’m confused….aren’t there some non real food ingredients in this recipe? Such as the corn tortillas and mexican blend cheese? I’m surprised 100 days of real food would endorse this recipe? Hi Michele. We love Catherine’s recipes. I, personally, endorse well thought out short cuts fairly regularly in the interest of sanity. ;) You can always make your own tortillas using Lisa’s recipe: https://www.100daysofrealfood.com/recipe-easy-whole-grain-corn-tortillas/ and shave your own cheese. Freeze the extra tortilla so you have them handy. I made this over the weekend and highly recommend it. I made this today and it came out mush. The mush tastes good, but it looks “predigested” if you will. What did I do wrong??? Why is it so liquidy? I even used half the salsa! That’s not good! Is it possible your slow cooker doesn’t get hot enough? Do you think i could do this with cream cheese, yogurt or milk instead of sour cream? 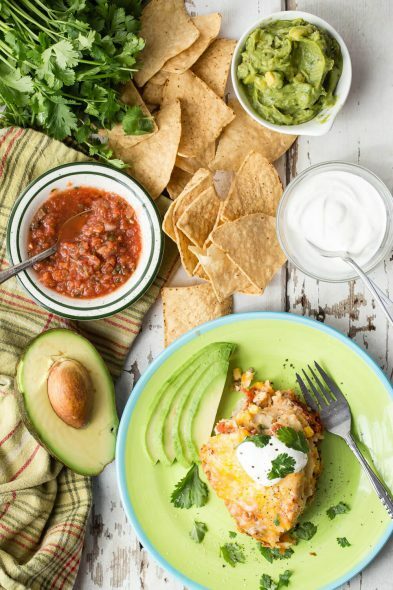 I love this recipe and have everything to make it except the sour cream…. Hi there. I often sub greek yogurt with a little lemon for sour cream but have not tried in this recipe. Do you think thin, mandolin-sliced zucchini could take the place of tortillas in this recipe, for those looking to lighten up the meal, or just get more veggies in? Thant’s not something we’ve tired. If you do, let us know how it turns out. I love that idea! You could make the noodles on a mandoline. Do beware that zucchini has a lot of water content which could make the dish turn out with more liquid throughout. Hi! This recipe was delicious! We all enjoyed it and it was simple to pull together. We will definitely make again. However, I am always frustrated when “prep” times seem way off… I am a mom of 4 kids and cook/bake all the time. There is no way anyone can prep this for the crockpot in 10 minutes – by time you chop your onion, garlic and saute, then saute turkey, then peel and grate your carrot and make sour cream mixture, this is at least 20-25 minutes prep and that doesn’t necessarily include clean up. And by time I do all of that, I might as well throw it in the oven to bake instead of pull out the crockpot! :) B/c time is of the essence when cooking for large families, I always value a true prep time. Great note! We should change to 15 minutes! How much is a serving of this recipe? Hi there. I usually do about a cup. My husband is allergic to dairy. Any ideas to substitute the cheese? Daiya Cheese is a great substitue and it really does melt (or at least the cheddar shreds I bought did) I found it had much more flavor than regular cheese. This is one of my favorite recipes! Do you know if anyone has ever tried doubling this recipe in a Crock-Pot? I am hoping to make it for a larger crowd but I wanted to get some reassurance that it turns out just as great when it is doubled. Thanks for your help! Hi there. Yes, you should be able to double this without a problem. Made this for the first time this week. DELISH! The only change I would probably make next time is to sub out the carrots for bell peppers. Just a personal preference. But this recipe is a keeper! Thanks! Hi, have made this recipe about 4 times and I, as well as my husband enjoy it. It’s perfect for me since I became aware that gluten is bad for my cholesterol. After researching, I decided to go very light on wheat. Although it freezes well, I’m now going to cut the recipe in half to save on freezer space. Thanks for a great recipe! I just made this recipe and it is delicious! I didn’t have ground turkey so I used ground beef. Yummy!! Will definitely make this again. How about replacing the meat with black beans? This sounds great, but I don’t eat meat.